Satellite communications were pioneered in the midst of the Cold War. The Russians launched Sputnik in 1957 which then worried the US leadership and security community, with it orbiting over head. Nikita Khrushchev was leader of the Soviet Union from 1955 until 1964, succeeding Joseph Stalin. During his period of influence there was the 1956 uprising in Hungary against Communist rule which was brutally suppressed, the 1960 shooting down of an American U2 spy-plane over the Soviet Union, the building of the Berlin Wall in 1961, and the Cuban Missile Crisis in 1962, which brought the world to the brink of nuclear war. 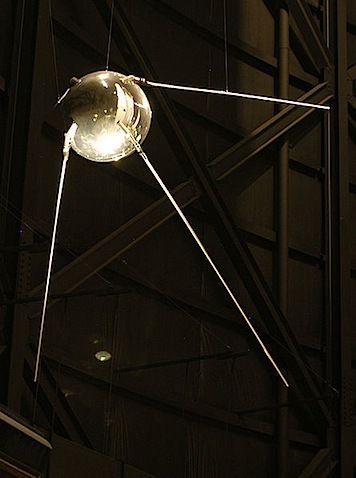 The launching of Sputnik then increased the rivalry between East and West, to add the space race to an existing arms race. This was followed by the Russians launching a dog into space in November 1957, and the first human, Yuri Gagarin in 1961. The competition between the Soviet Union (USSR) and the United States (US) for supremacy in space exploration not only led to many space achievements, including the US putting a man on the moon in 1969, but many technological advancements then flowing on to the great benefit of everyday life. Youngsters now take it for granted when accessing overseas content at the point of a mouse and the click of a button, courtesy of the Internet, but it wasn’t always so. 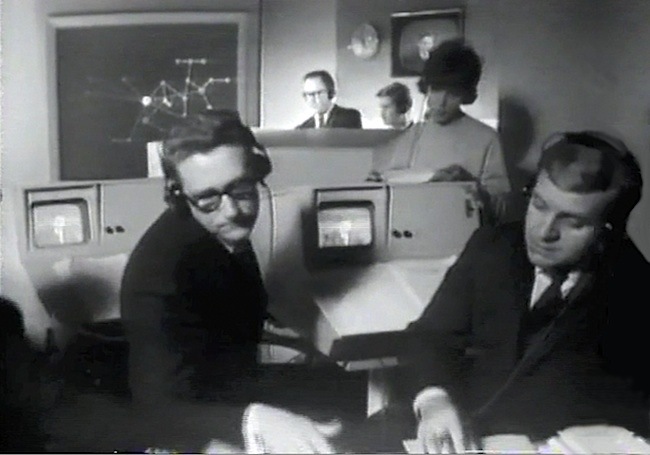 Australia, and Perth in particular, was isolated by great distances until the advent of satellite telecommunications, which when a sudden moment of opportunity occurred in 1966, required a rushed 900 kilometres trip by television teams to Carnarvon to make the first live television contact with the outside world. A history making occasion that connected relatives from opposite sides of the planet together for a short but memorable time. A moment that was surpassed the following year when the entire world was connected for a two hour satellite special. The world may have been in turmoil, but the ‘All You Need Is Love’ message the Beatles left us with an the end of that special, is still relevant in the world of today. In an article entitled “Extraterrestrial Relays”, that was published in the Wireless World magazine during 1945, Arthur C. Clarke wrote that by placing three space platforms into special orbits 22,300 miles above the equator, worldwide communications could be achieved. The Russians caught everyone off-guard when they launched Sputnik, the world’s first artificial satellite to be placed into orbit, on October 4, 1957. The satellite emitted radio signals for 22 days, until the batteries ran flat. These signals were monitored by amateur radio operators throughout the world. It spent three months in orbit before reentering the Earth’s atmosphere and burning up. The United States’ first satellite was Explorer I, which was launched on January 1, 1958. On December 18, 1958 the Signal Communication by Orbital Relay (SCORE) satellite was launched and broadcasted a message from President Eisenhower – “Peace on Earth, Good will toward men” – for 12 days until the batteries failed. The first television signal was relayed from Europe to the an experimental satellite named Telstar in 1962. In the six months following the launch, stations in the United States, Britain and France conducted about 400 transmissions with multichannel telephone, telegraph, facsimile and television signals, and they performed over 250 technical tests and measurements. The first geosynchronous communication satellite, Syncom II, was launched in 1963 and flew in an orbit circling 37,000 km (22,300 miles) over the Atlantic Ocean. Geosynchronous satellites appears to “hover” over one spot on the Equator. To do this, it must travel at the same speed as the Earth’s rotation. This enables a receiving dish on the Earth to point at the one spot in the sky rather than “track” its motion. This satellite’s first use was for US military communications in 1963. The world’s first commercial communication satellite, called Intelsat I (nicknamed Early Bird), was launched into geosynchronous orbit above the Atlantic Ocean by a Delta D rocket on April 6, 1965. The second planned satellite Intelsat II F-1 was launched October 26, 1966, but failed to achieve geosynchronous orbit due to short burn of its apogee kick motor (AKM), the rocket engine that is employed to put it into an orbit where its furthest from the earth. The apogee engine thrust terminated approximately 4 seconds after ignition. Normal burning time would have been 16 seconds. Despite its nonsynchronous orbit, the satellite was used briefly to transmit live television and other communications traffic. 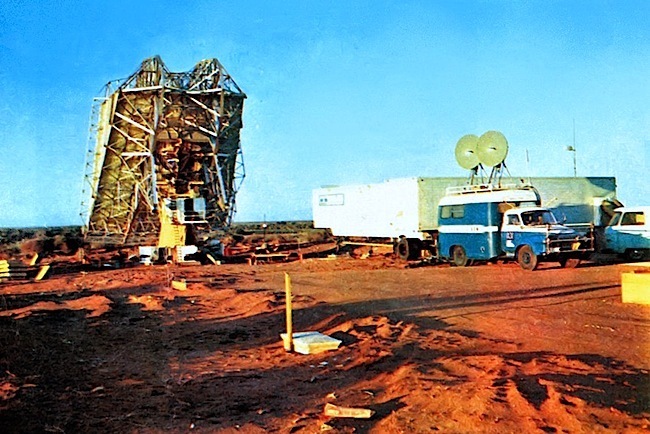 Three days after the launch, the Australian Overseas Telecommunication Commission (OTC) Satellite Earth Station at Carnarvon in Western Australia was established to meet the need for more reliable and higher quality communications for NASA’s Apollo Moon project. In late 1966, before Intelsat II F-1 was out of range, an agreement was secured by Australia to allow our television stations to use the doomed satellite free of charge. At this time a ‘sugar scoop’ antenna was put into operational to communicate with the Intelsat satellite, but they would only have a brief chance to test the satellite TV communications before the broadcast, and the satellite then drifting away over the Indian Ocean. At short notice, a large contingent of ABC engineers, technicians with an EMI equipped Bedford outside broadcast van, link truck and support vehicles were driven the 900km from ABW Channel 2 in Perth to Carnarvon. A smaller contingent was sent by TVW Channel 7 in Perth, with just one television camera and their small International OB van, pulling a power generator, followed by a support vehicle. 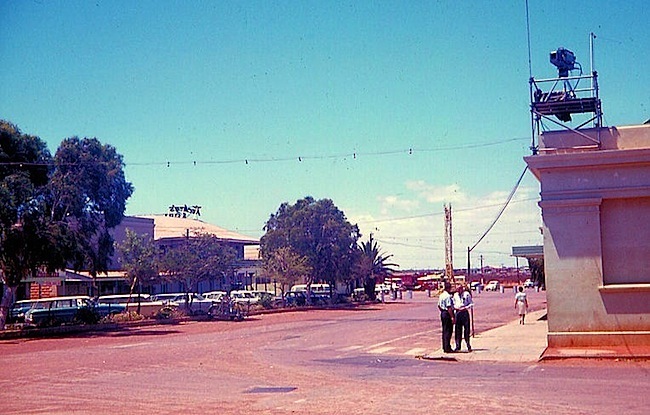 Looking along Robinson Street in Carnarvon. In the distance is the tower used to link the signal to the OTC satellite station. Photo: Alan Gilham. The ABC-TV links truck beside the OTC antenna used to uplink the TV signal. A microwave link was established to the OB van in town, 5 kilometres away. For up to twenty minutes, a one-way television link was set up between Carnarvon and the Goonhilly Down Earth Station in the UK. The highlight was a direct telecast between the ABC and BBC which reunited British immigrants living in Carnarvon with their relatives who had been brought into the BBC studios. Meanwhile, TVW Channel 7 in Perth sent vision of Eric Walters reading from the front page of the Daily News to UK commercial station ITN, but on return the signal failed before anything of great use could be received. 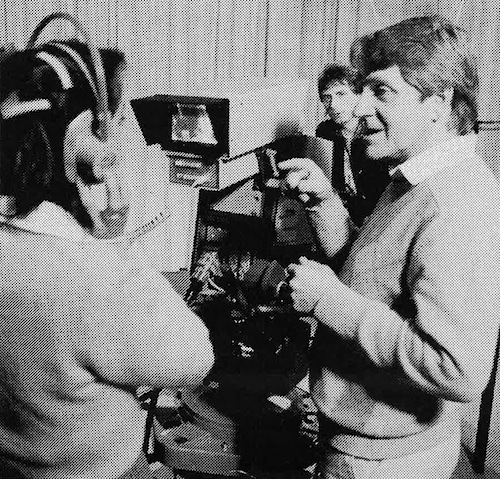 The flawed content from the UK was recorded in Seven’s small OB van on a RCA TR5 2 inch quadraplex videotape machine… for intended replay on its return to the Perth studios. The TVW crew consisted of Eric Walter (presenter), Michael Gale (journalist), Gordon McColl (camera), John Quicke (Chief Engineer) and Peter Hobson (technician and operator). Brian Treasure made the arrangements. The Intelsat satellites were eventually used to blanket the globe in geosynchronous earth orbit over the Atlantic (Early Bird 1965), Intelsat II F-2 over the Pacific (Lani Bird 1967), and Indian oceans (1969 when Intelsat III F-3 was moved from over the Pacific to over the Indian Ocean in May 1969). It was not until July 1970 that a micro-wave link enabled direct television program transmission between the east and the west coasts of Australia, but at great cost to book the Telecom bearer. Meanwhile, the last section of the Eyre Highway linking WA and SA was finally sealed in SA in 1976. 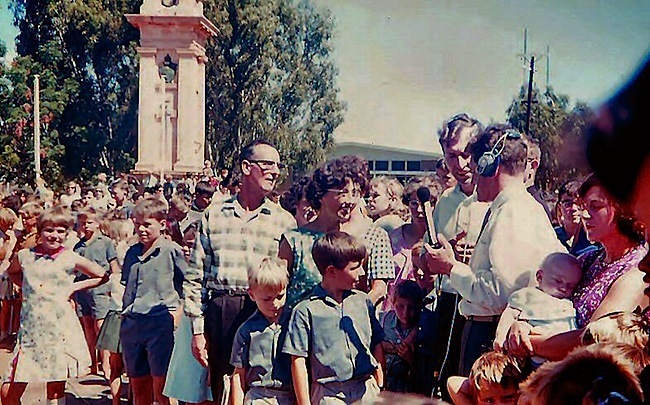 At this time TVW produced an outside broadcast tonight show from Eucla to commemorate the event, The show was called “In Eucla Tonight” and was hosted by Stuart Wagstaff with help from Sandy Baker. A documentary titled “No More Bulldust” was broadcast just prior. In 1985, Australia’s first two satellites were launched (A1 in August and A2 in November) and the AUSSAT domestic satellite services commenced. The domestic satellite launch significantly reduced the cost of program delivery to Perth from the east and vice versa. Backtracking on the satellite history which impacted on Australia..
Further to the 1966 Intelsat II satellite failing to achieve geosynchronous orbit, leading to the historic Carnarvon event. Intelsat II F-2 was launched on January 11, 1967, into geosynchronous orbit above the Pacific near the International Date Line. Regular 24 hour commercial service via the satellite began January 27, 1967. The operation linked earth stations in the United States, Hawaii, Australia, and Japan. After July 1970, programming received from the satellite over the Pacific could then be sent West via the micro-wave broadband link that crossed the Nullarbor. Our World was the first live, international, satellite television production, which was broadcast on 25 June 1967. 14 countries participated in the production that was transmitted to 24 countries with an estimated audience of 400 million people. The program was coordinated by the BBC in London. The Soviet Union and several other Eastern bloc countries pulled out a few days before the broadcast to protest the west’s support for the Six-Day War. Western Australia missed out on this live event, and had to be content to view a replay after the videotape was air freighted to Perth. The signal is carried by four satellites 23,000 miles above the earth, the Intelsat I (Early Bird) and The Intelsat III (Canary Bird) satellites over the Atlantic Ocean and NASA’s ATS-1 and The Intelsat II F-2 (Lani Bird) satellites over the Pacific. Our World was the first live, international, satellite television production. It was broadcast on 25 June 1967. The program begins by looking at some of the earliest arrivals on our planet with babies born around the world starting with Japan at 4:04am, then Denmark one hour before sunset at 8:06pm, next its 1:06pm in Mexico City, then 3,000 miles to the north at Edmonton in Canada where a Cree Indian baby is born, only four of some 1,800 born in the short time since the program began. Its a summer evening in Paris, a winter morning in Melbourne, just before lunch in Vancouver, and the middle of the afternoon in New York as we see what our neighbours are doing across the world. Owing to language issues for Australians, interpreters translated the foreign commentaries for Australian Broadcasting Commission (ABC) announcers to provide an English voice-over where necessary. The ABC announcing team consisted of James Dibble, Margaret Throsby, John West and David Hawkes. The program takes us from country to country including a pass through Italy where Franco Zeffirelli is on location for Romeo and Juliet, to the Abbey Road Studios in London and the Beatles making their recording of ‘All You Need Is Love’, to close the broadcast. Here is the first 30 minute and the last 6 minutes of this historic and pioneering two hour television event. Its worth noting that David Hawkes had a big impact on broadcasting training in Western Australia. 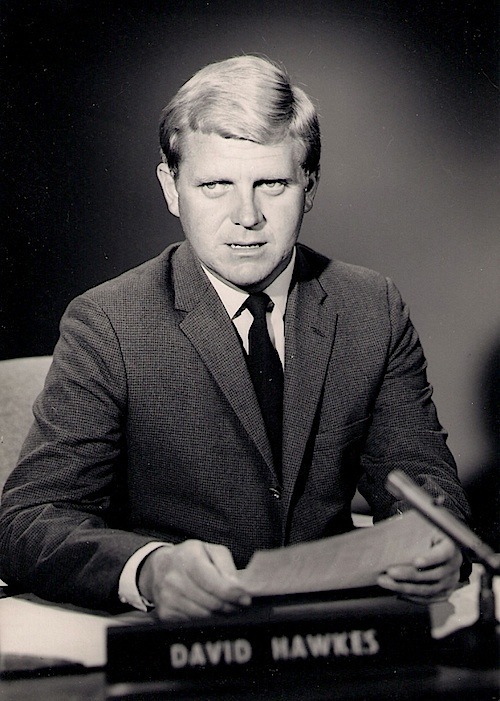 Though David began his broadcasting career in Queensland, he later became well known to WA viewers and listeners. David took over the 6WF (720) breakfast program from John Juan in 1974, presented concerts with the WA Symphony Orchestra, recitals for ABC Classic FM, hosted the program “Jazz on the Terrace” and provided commentary for countless outside broadcasts: Royal visits, Anzac Day, and other special occasions. For ABC television in WA, David read the news, fronted the games show “Fair Go!”, co-hosted the cooking program “Two for the Pot”, presented concert telecasts from the Perth Concert Hall, was anchor for the current affairs show “State Wide”, and link for many election night Tally room specials. David was also responsible for setting up the department of Media Performance, at the WA academy of Performing Arts (WAAPA), in Edith Cowan University. WAAPA was established in 1980 to provide performing arts tuition comparable to the highest calibre of national and international training benchmarks to be able to meet industry needs around the globe. Former ABC announcers filled the position of Head of WAAPA Broadcasting on all occasions to date. The school is located in the suburb of Mount Lawley, Perth, Western Australia. It is regarded as one of Australia’s leading performance training institutions. WAAPA also teaches acting, music theatre, directing, dance, jazz and contemporary music, classical music, arts management, production, design, as well as broadcasting.